STAAR Celebration is scheduled for Saturday, Oct. 13th in front of Lansberry Elm. from 11am to 1pm. Trinity ISD STAAR Celebration is scheduled for Saturday, Oct. 13th at the field in front of Lansberry Elm. from 11am to 1pm. You are invited to attend the Trinity ISD STAAR Celebration! It is scheduled for Saturday, Oct. 13th at the field in front of Lansberry Elementary from 11am to 1pm. 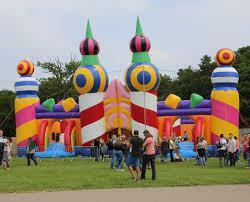 There will be several "bounce houses" and other fun activities! Free hotdogs, snow cones and bottled water will be served.